Searching for the perfect espresso? This is usually a path marked by lots of dollar signs and failed brews. To save some time, we’ve got the best picks for an espresso-fine grinder that will lead you to the peak of the mountain. Whether you’re looking for a cheaper alternative, maybe a manual grinder, or a high-end electric grinder, perhaps somewhere in between, then we’ve got you covered. 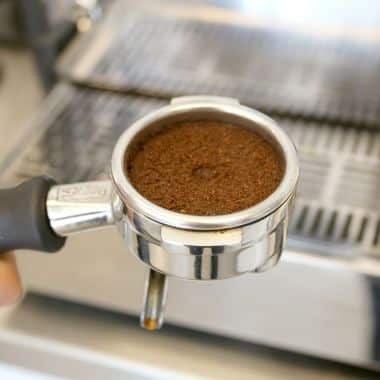 There are many factors involved in finding the right grinder for your espresso. Price is not the only consideration and we hope to prove that to you in our list below. So without further delay let’s touch on all price points and as well as both manual and electric options. Originally the KRUPS company began over one hundred years ago to develop high precision scales, today they’ve delved into various kinds of kitchen appliances and perpetuates the high standards of quality that have been set in the coffee grinding market. 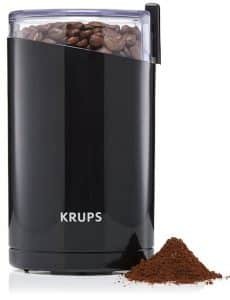 The KRUPS F230 Electric Grinder is able to process beans effectively and for as affordable as this grinder is it’s worth noting that the fine espresso particles will suit your needs. Grinding for a few seconds will reveal a ‘Turkish coffee’ grind size and a few more will get the desired fine espresso grind. 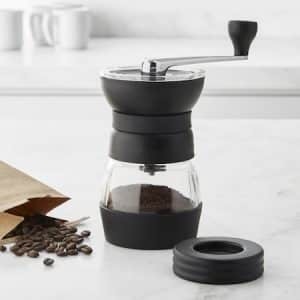 This grinder not only looks and operates in a minimalist fashion it’s a sound investment if you’re new to buying fresh beans for your morning coffee. This is an impressive grinder that costs next to nothing, and we’re thankful to KRUPS for creating it. Affordable? Portable? Check and mate! This ceramic burr grinder is off fantastic quality and won’t take a monthly car payment to deliver results. The construction is on par with the grinding process, as the Japanese company takes pride in getting the espresso grind to its users in the most efficient way. A uniform grind is easily attainable from this manual grinder. Additionally, the non-slip rubber base makes it easier than ever to control each stroke of the removable handle. The bottom line is that this affordable grinder is compact, dependable and grinds from superfine espresso to coarse for French-press brewing. 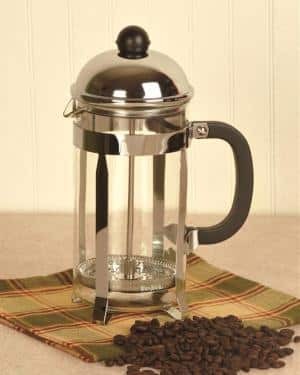 If espresso is a part of your morning routine and you want something small enough to produce a single dose, then you should have no qualms about the Hario Ceramic Coffee Mill. Hovering right around the fifty dollar mark, this is an easy investment to make into the quality of your espresso practice. 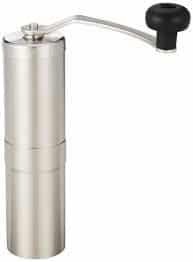 Not dissimilar from a space-age pepper mill, the Porlex JP-30 is a solid construction hand grinder that features ceramic burrs. The grind action here is adjustable from coarse to fine and has at least two settings for espresso. In its class of super sleek compact grinders, the JP-30 is one of supreme durability and function. 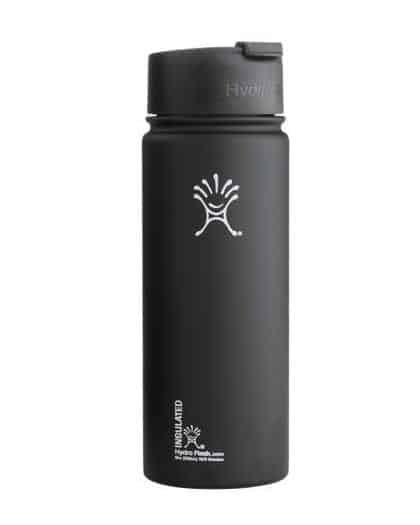 The fact that it was made to fit ergonomically into an Aeropress is just one of the examples of forethought that went into its impressive engineering. Slightly more expensive than the Hario, but for its price, you’re able to check off some of the more luxurious features of owning a hand-grinder. Though man users might not consider this the best espresso grind, for your money this is a great foray into the world of fine and fresh grinding. Many coffee experts would shun an inexpensive electric grinder like this, touting that it’s too good to be true. Well, the Cuisinart DBM-8 Supreme grind is a convenient take on the grinders that the pros use. It’s a great and cost-effective way to transition into grinding fresh espresso beans daily without having to spend an astronomical amount. Cuisinart makes products for the home that have long lifespans and can handle the day to day wear and tear. Sure the Cuisinart can get you a fine espresso grind, but where it really shines is in the quantity an quickness it produces. 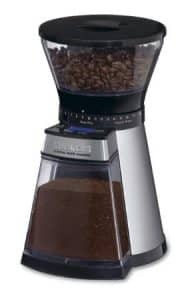 The large hopper is matched with a great storage bin that fits directly into the base of the grinder, holding a maximum of thirty-two cups of grinds. This is what makes the electric grinder here more appealing than a hand grinder for just a little higher price-point. 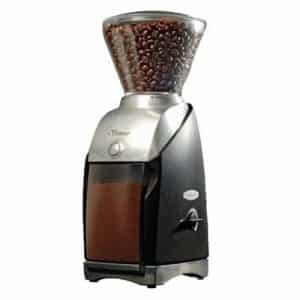 Likely to be one of the most affordable electric burr grinders one will find. 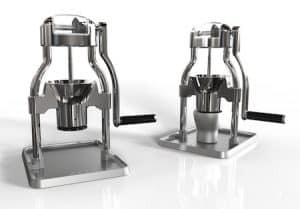 Made Possible by fundraisers on the Indiegogo platform, the ROK Coffee Grinder was created to suit a specific need in the manual grinder niche. 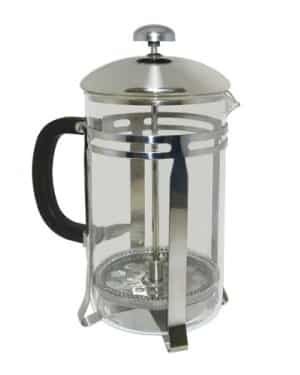 This is a manual burr coffee grinder that features a durable die-cast aluminum frame and a set of 48mm stainless steel conical burrs, yes we’re still discussing a manual grinder. It’s great for producing grounds on par with more expensive electric grinders. Unlike other manual grinders, with minimal effort is required. After a mere 30 seconds of grinding, you’ll have enough fine grinds to produce a double shot of espresso. It’s beautiful and fast, making it one of the more luxurious grinders on this list, and maybe one of the greatest hand grinders you’ll see on the market today. And it’s still a much quieter grinding session than electric coffee grinders are capable of. The Baratza Virtuoso’s a professional-grade 40mm conical burr grinder that comes in at a low price point for its quality. Baratza is known for their grinders ability to perform a consistent, fine grind and this is no exception. The Virtuoso can handle the wear and tear of a commercial operation and should be no problem for your home uses. This grinder comes at a low investment but performs at a level with the pros. By focusing on particle size uniformity the Baratza Virtuoso is able to outperform many of the grinders in its class. While the Encore was Baratza’s entry-level grinder, the Virtuoso is their next step up, improving the design of the previous model. The direct current motor turns slowly and quietly and will not heat up your coffee as it grinds, even during long grind cycles. It takes up little counter space and is a small investment into fresh grinding, what say you now? 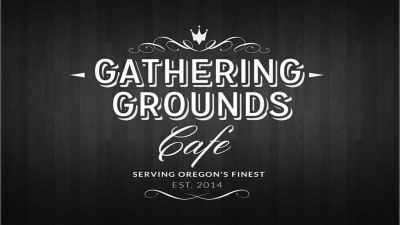 Dosing for espresso? Don’t want to break the bank? The Breville BCG600SIL is rightfully named as the dose control pro when you’re grinding directly into its attachable porta-filter. Grind beans with stainless Steel conical burrs designed to minimize grinding heat and protects the quality of the end product. Capable of some of the finest Espresso, you’ll be happy to know that it’s a step in the right direction for your espresso brewing. One can really brag about their dosing control here, as it’s possible to stop mid grind to tamp the grounds in the porta-filter. Getting the right espresso shot is well within possibility as the grinder can work in one-second increments. For the price, it’s hard to go wrong here, and once you make this step it’s likely the manual grinders of yore will not satisfy. Now you can be picky about your espresso shot, and cost-effective. The Forté-AP, which translates to something that excels, and All Purpose grinder, must really be a top performing machine. Of course, it is and can grind from coarse to fine and grind directly into a portafilter so espresso is like its first language. The burrs are constructed from ceramic, and a flat 54mm surface area really contributes to an efficient grind. The praises of this machine have been sung, and serious enthusiasts of fresh coffee grinding will find the investment to repay in dividends. If dialing an espresso dose is an important aspect of your grinding experience then the intuitive interface will help guide you towards discovering your preferences. The Baratza Forté–AP allows you to dose by weight or time. It’s all accessible via the space age touchscreen controls. The Florence, Italy born company, Eureka, has taken powerful grinding to a whole new level. 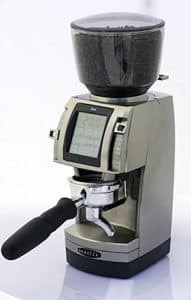 The Olympus 75E is an espresso grinder packed with a 450-watt motor power that churns an aggressive 75 mm burr set for a stunning 1350 rotations per minute. 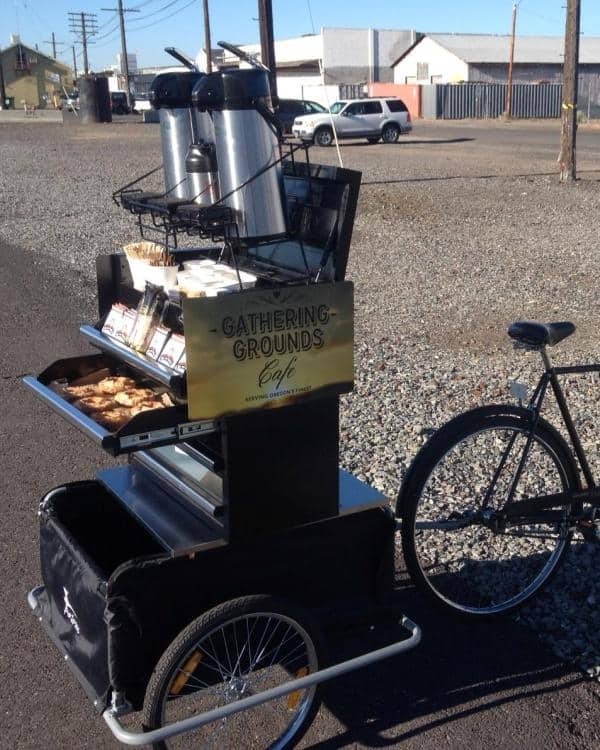 This is the Maserati of coffee grinders. 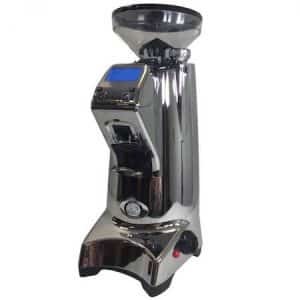 The ACE (Anti-Clumps & Electrostaticity) system was developed to ensures an incomparable cleanliness and dose consistency, as well as engineering to make the smoothest, quietest grind session possible for an electric burr grinder. 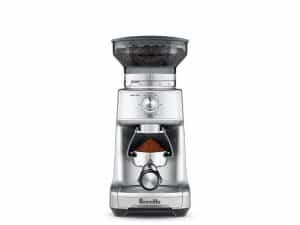 Coming in at the top of our list as the most expensive, one might find that the Eureka Olympus 75E is worth every penny for the luxurious grinding capability and the perfectly fine espresso dose it wields. Hopefully, you’ve found the right espresso grinder for your price range. Espresso should be accessible to all, and we think that the right grinder for you is out there, regardless of your budget. If you’re still interested in perusing, check out our coffee-related gear here.